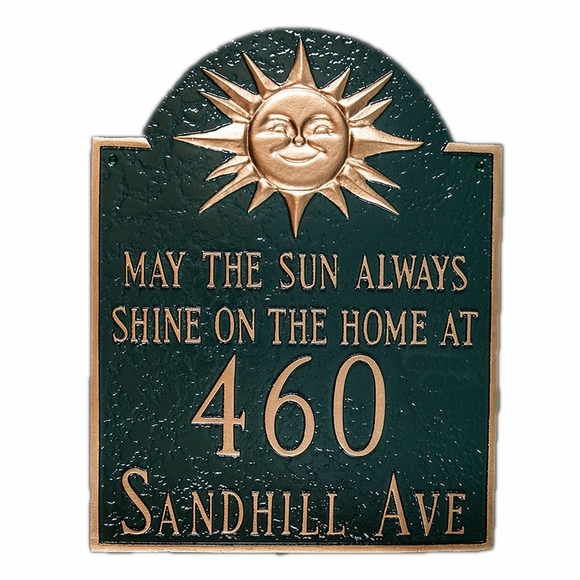 Personalized May The Sun Always Shine Address Plaque - - arch shape plaque with a smiling sun at the very top. Made in USA. Standard text reads MAY THE SUN ALWAYS SHINE ON THE HOME AT. Holds up to five 3" address numbers and up to twelve 1.25" characters (including spaces) for the street name on the bottom line. Sunshine address plaque with house number and street name. Solid cast aluminum construction. Characters and border are part of the sign, not added on. Love the quality, color, looks and everything about this!!! Was hesitant to order the sign fearing the metal sign may be flimsy. Happy with the purchase.